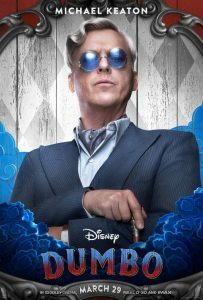 Director Tim Burton reunites his stars Michael Keaton and Danny DeVito from the 1992 smash hit sequel Batman Returns in Disney’s live action remake of Dumbo also starring Colin Farrell and Eva Green. The setting is a travelling circus in post-war Missouri where Dumbo is born to a mother elephant and whose long ears enable the baby elephant to fly at the coaxing of a feather with the help of children Milly and Joe Farrier played by Nico Parker and Finley Hobbins. 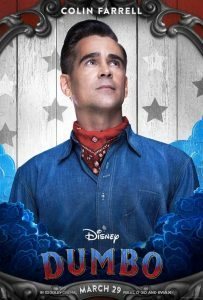 The children’s father and returning World War I hero Holt Farrier is played by Colin Farrell (Roman J. Israel Esq, The Beguiled, Widows). 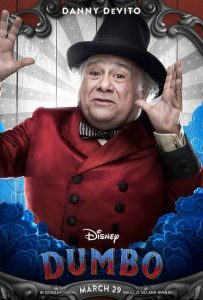 Danny DeVito (Big Fish, The War of the Roses, Get Shorty) stars as Max Medici who comically runs the travelling circus. 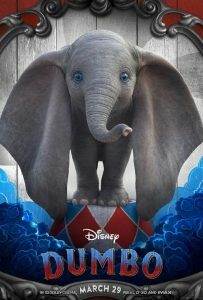 Screenwriter Ehren Kruger does take a while to get the story of Dumbo off the ground and the first half of the film does appear to be slightly unexciting. Luckily, the moment Michael Keaton and Eva Green appear on screen, Dumbo becomes a fascinating tale of intrigue, dreams dashed, benevolent dictatorships and corporate greed which allows for the wholesale exploitation of animals for circus tricks which naturally is an overarching theme in this Disney tale of reunions, captivity, animal cruelty and entertainment. In any case, what is a Disney movie without a moral cause and Dumbo is no exception. 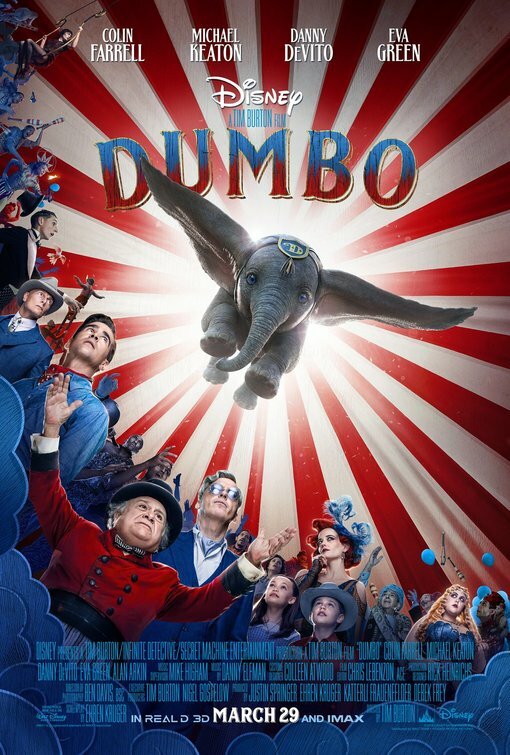 Visually, Dumbo is fascinating and the production design and costumes are brilliant and slightly garish which is what to expect in a Tim Burton film who directed such classics as Sweeney Todd, The Demon Barber of Fleet Street, Ed Wood, Big Eyes and Alice in Wonderland. As the action moves swiftly from the Missouri plains to New York where Keaton’s flamboyant entrepreneur V. A. Vandevere played with a chilling panache by Oscar nominee Michael Keaton (Birdman) buys Medici’s circus to be supposedly incorporated into Vandevere’s lavish amusement park Dreamland financed by a ruthless banker J. Griffin Remington played by Oscar winner Alan Arkin (Little Miss Sunshine) . It’s at Dreamland where Dumbo has to perform daring circus tricks which prompts him to fly around the tent with precarious set pieces collapsing all around the poor elephant. It’s also at Dreamland that Vendevere’s wicked intentions are revealed much to the horror of Medici and the one armed Holt Farrier. 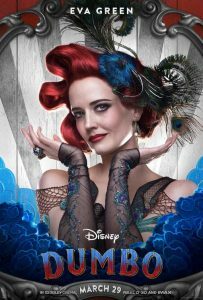 Eva Green’s sympathetic Parisian acrobat is a breath of fresh air amidst the CGI heavy retelling of Dumbo which is entertaining and certainly spectacular but does fall short of the mark. Unfortunately director Tim Burton misses the mark with Dumbo but the gorgeous production design outshines the lacklustre story line which might not produce tears in viewers’ eyes. Dumbo gets a film rating of 7 out of 10 but as a lavish post-war circus film it could have been absolutely phenomenal but remains adequately entertaining. Ideal viewing for children and is definitely a film worth seeing on the Big Screen.